The Jubilee weekend continued in spectacular fashion this evening with the Diamond Jubilee Concert . William and Kate joined other Royals for the extravaganza outside Buckingham Palace. Ten thousand fans, all of whom had been given free tickets through a public ballot for the event attended the concert whilst thousands more lined the streets. 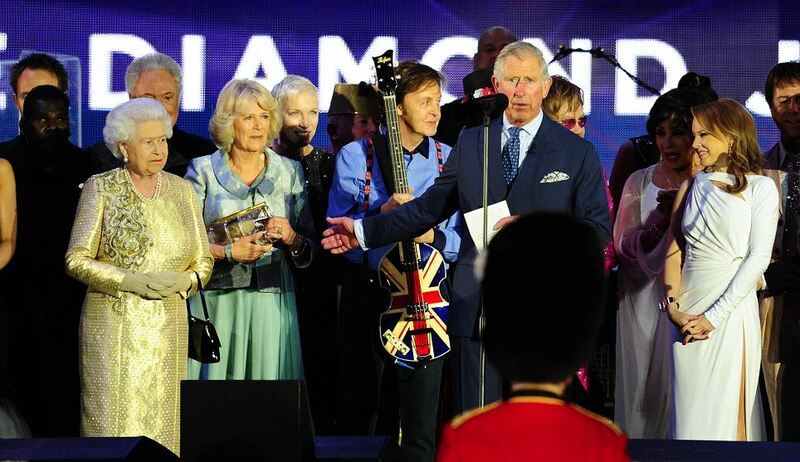 The star studded line up included Paul McCartney, Shirley Bassey, Tom Jones, Elton John, Stevie Wonder, Kylie Minogue, Cheryl Cole, Jessie J, Ed Sheeran, Madness, Alfie Boe, Grace Jones and Kate favourites Robbie Williams and Gary Barlow. Take That singer, Gary Barlow organised the event and said Her Majesty and Princes William and Harry had a great deal of input in selecting the acts. Guards posed with singer Cheryl Cole after her performance of 'Need you Now' with Gary Barlow. You can watch their performance here. 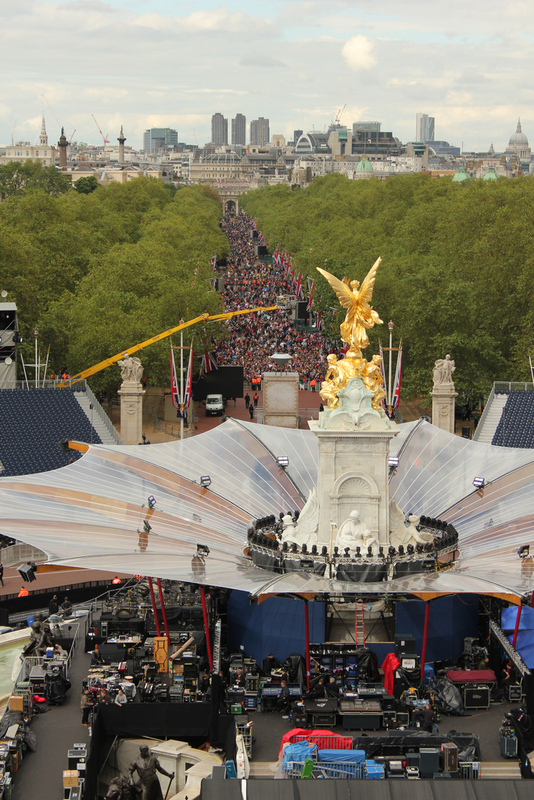 A view of the mall before the concert began. A look at the Royal box. 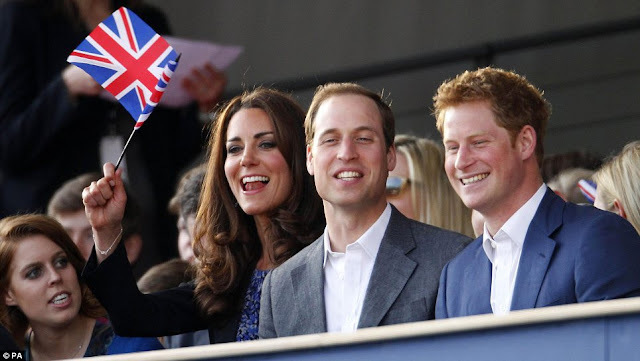 Kate was seen waving her British flag throughout the concert, She and William also sang along to Elton Johns performance. The most talked about song of the night, the specially commissioned song for the Queen, 'Sing', written by Gary Barlow and composer Andrew Lloyd Webber. Mr Barlow visited Australia, Kenya, and Jamaica in order to immerse himself in the music of the commonwealth. Prince Harry makes his recording debut on tambourine :) The sheet music and words to 'Sing' are available to download here. 'We played her the song, and she was most excited that we had collected people from all round the world. She was asking about the characters, who they were and what they did. It was lovely, really nice. And we were officially told that she was - delighted with the song'. Projections appeared to be open up the Palace as if it were a dolls house. Very sadly Prince Philip was hospitalized today with a bladder infection and will miss the rest of the celebrations. The Prince who turns 91 on Saturday was taken to the King Edward VII hospital in London from Windsor Castle and will remain there for a few days. He is said to 'very disappointed'. No doubt it is a difficult time for him and of course Her Majesty. Prince Philip also missed Christmas at Sandringham after suffering chest pains and underwent a coronary stent procedure. I wish him a speedy recovery. 'Crafted in a silk rich fabric with a petal print design. Featuring a round neckline with a bound edge, cropped sleeves, gathering to the waist and an exposed gold tone zip fastening to the reverse'. Whistles express their excitement via Twitter and officially confirmed Kate's dress is theirs. 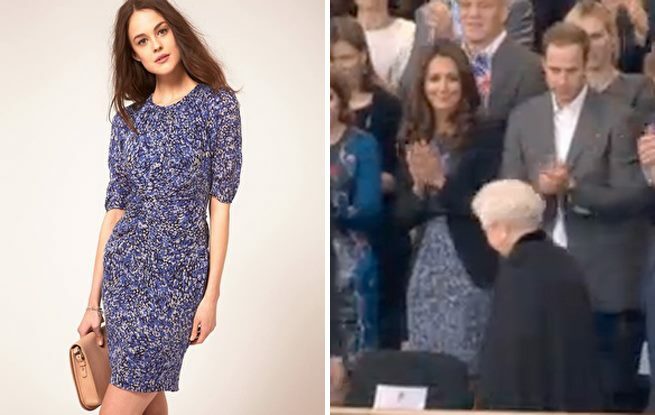 The colour is quite classic while the print is a fun choice for a concert and of course, always nice to see Kate choosing a high street brand especially for a Jubilee event. Kate teamed her dress with a black belt a black McQueen jacket. 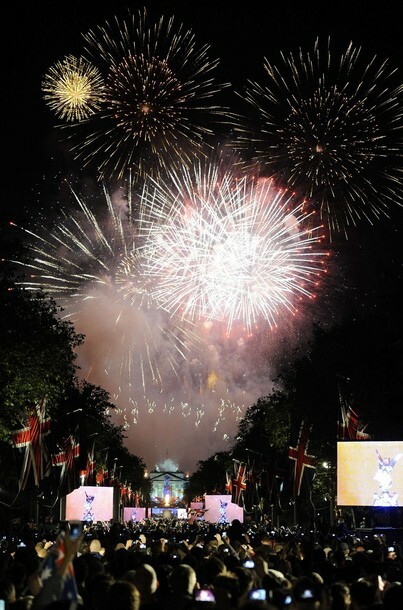 Over 4,000 beacons were lit around the world today to mark the Queen's Diamond Jubilee. At 10.30 pm Her Majesty lit the National Beacon outside Buckingham Palace. Prince Charles delivered a speech after the performances finished where he thanked HM 'for making us all proud to be British'. After the concert William, Kate hosted an intimate reception at Buckingham Palace to thank the artists on behalf of the Queen for participating in the event. 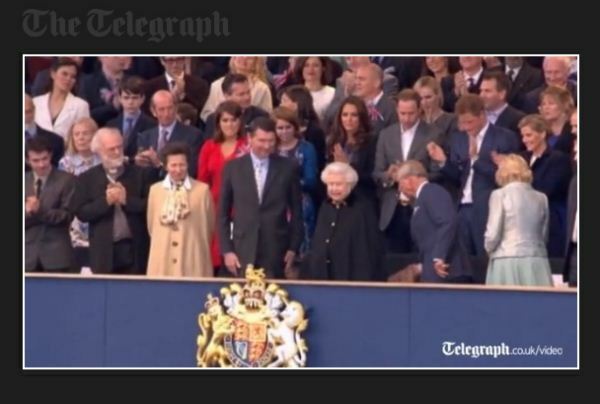 You can watch a video of HM lighting the beacons at The Telegraph and highlights from the concert here. This youtube channel has most of the show uploaded. Thank you so much for the first impression! I wish you a nice evening. Do you have video or images of Kate and Will singing "your song". The song they danced to at their wedding? Can't wait to watch this on tv tonight (it's morning here in Australia). Poor Prince Philip, he's had to miss Christmas and now this. Love seeing the royals at an event like this, they seem so relaxed and happy. Thank you Charlotte for up dating us on teh concert. i am very sorry that Prince Phillip was not able to attend and will miss tomorrow's events. 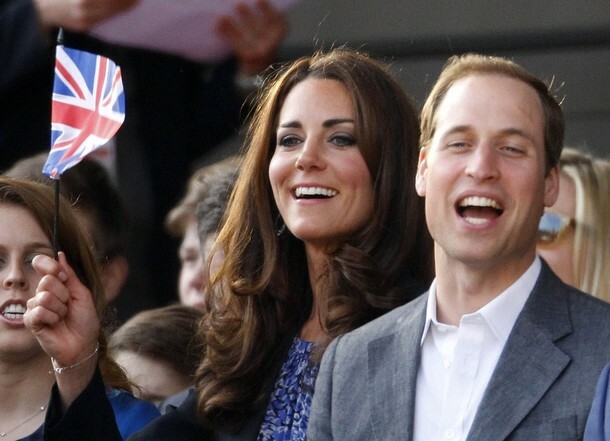 Prince William & his beautiful Duchess looked like they will having a good time. Do you know if there is any photos of them sing to the Elton Johns song "The Song". It would be great to see them sing that since that was the song for their first dance at their wedding. I liked her dress too. Do you know if the Middletons were present for the concert? I am excited we will get to see the concer there in the states tomorrow. It will be on ABC at 9pm eastern time. however i have to take exception to your saying bodycon dresses are not kate's typical style. have you forgotten yesterday's tight mcqueen? the beige reiss she wore to meet the obamas, fresh from her honeymoon? the grey dress to the imperial war museum? the issa engagement dress! thank you so much for this post. it made me cry reading about prince phillip. on a day like today Her Majesty would want her husband by her side and also he was with her thru those 60 years and he deserves to be part of those celebrations. i am so sad about this. kate looks great but the Queen is shining. Loved the dress and how happy they seem. So excited for the concert special on Abc tomorrow. Poor Prince Phillip- he always seems to get sick at the worst times. THANK YOU so much for this lovely report and the youtube link! i watched some of the highlights this morning (in Australia :D). 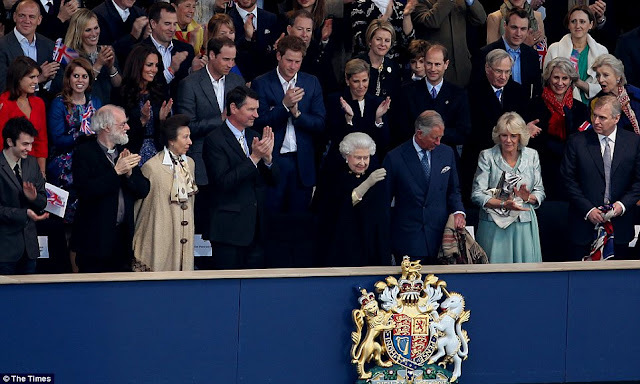 the queen looked so moved when charles thanked her for her service! am just reading a book HM life and all i have for her is pure admiration! and i am not even british :) what a wonderful woman you have representing your country. you are so lucky! so sad about prince philip though! i would love to see kate and william sing along. it would be lovely if you can find it! I wish we could have watched the concert live over here in the US! 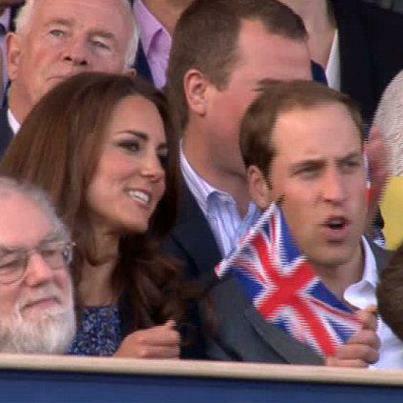 Kate is so cute waving her flag. Thank you for all the quick updates this weekend, as always so detailed and thorough! Do you know of a link to a video of the entire concert coverage? My DVR failed me! Loved everything Catherine wore. Just felt sorry for Prince Harry with no "wife" Come on Chelsea - marry him - we love you! !